MAS-SP displays "Artists of Taubaté". Disclosure. 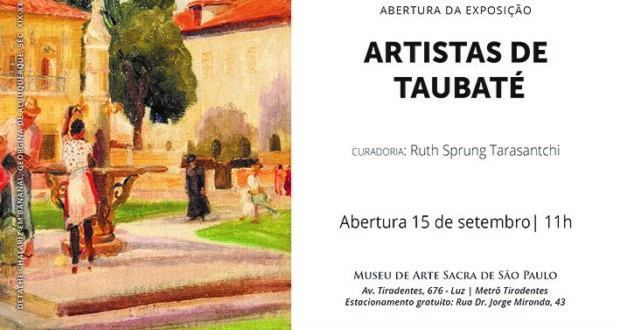 A Museu de Arte Sacra de São Paulo – MAS-SP Displays “Artists of Taubaté“, with works Clodomiro Amazonas, Francisco Leopoldo e Silva, Georgina de Albuquerque and Monteiro Lobato, under the curatorship of Ruth Sprung Tarasantchi. The exhibition is composed of 80 paintings in various techniques - watercolor, oil on canvas, among others – and sculptures, which they are little known and represent the most significant production of this batch of fellow artists, Taubate born between 1879 and 1885. “geniuses, great artists, arise from time to time. At once, in one decade several, however, almost never emerged. in Taubaté, however, It happened”, comments José Oswaldo de Paula Santos, Chairman of the Board MAS-SP. This shows unprecedented, four odd personalities of Brazilian art unite: Clodomiro Amazonas, great landscaper and author of paintings with bucolic theme depicting ipês and flamboyants; sculptures of Francisco Leopoldo e Silva complement the exhibition; Georgina de Albuquerque and its Impressionist works, in pictures , marine and urban and rural images; and finally, Monteiro Lobato, one of the greatest exponents of Brazilian literature of all time, It surprises us with canvases and watercolors, rare works carefully mined for new show MAS-SP. “Artists of Taubaté"Exposes delicate and rare pieces, making accessible to the visitor a little-known production and of great importance to the national art, these four fellow artists and the same generation. 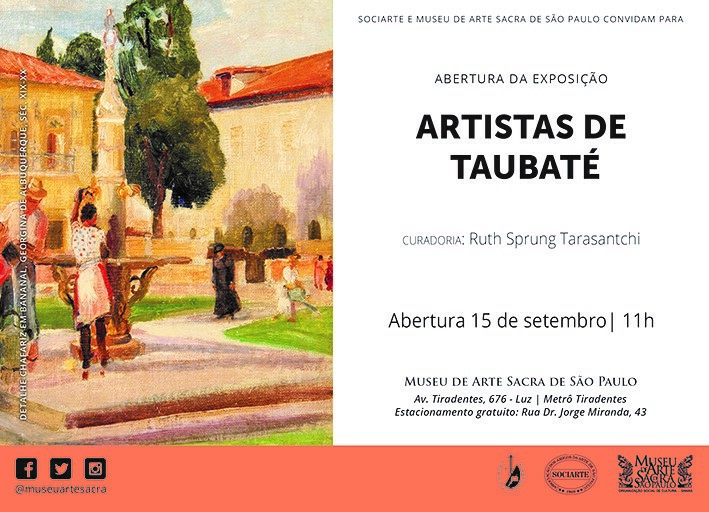 as follows Ruth Sprung Tarasantchi: “Now, this is one of the main cities in the Paraíba Valley, with an important role in the economic development of the country, is pleased to honor these artists with the exhibition "Artists of Taubaté", that also raised in the panorama of Brazilian culture. " Time: 09h às 17h, and Neapolitan Crib room from 10 am to 11 am, and from 14h to 15h. Entrance: On Saturdays the museum is free, the other days entry: R$ 6,00 (One piece) | R$ 3,00 (Half national entry for students, private school teachers and I.D. Young – upon proof) | exemptions: children up to 7 years, adults from 60, public school teachers, disabled people, ICOM members, police and military – upon proof. Plastic artist, researcher and historian of arts, Curator, Restorer, collection director of the Jewish Museum of Sao Paulo, art director of the Association of Friends of the Art of São Paulo (Sociarte), Artistic member of Steering Board of the Pinacoteca do Estado de São Paulo and the Association of Critics of Art of São Paulo. Born in Sarajevo (Current Bosnia and Herzegovina), in 1933. He spent much of his childhood in the village of Bugojno. In 1942, during a World War II, she and her family were taken by the Italian army to Castel Nuovo Don Bosco and, the following year, for Ferramonti Concentration Camp di Tarsia, in southern Italy. The Sprung family saga lasted in Italy until 1947. In Brazil, Ruth studied at the Colegio Santa Ines and completes the high school at Colegio Bandeirantes. The interest in the arts in its different aspects is one of the early stages the practice of drawing, as soon as his family settles in São Paulo, when Ruth goes to attend the live-model classes of the Paulista Association of Fine Arts. I entered the School of Medicine in Sorocaba, where it remained for three years. His artistic vocation, however, speak louder, and then let the medical school to join the School of Fine Arts of São Paulo. In 1974 entered the master's Escola de Comunicações e Artes (ACE USP), defending the thesis "The quiet life in Pedro Alejandrino painting" in 1981. After five years, defends the doctoral thesis "Landscape Painters in São Paulo" (1890-1920).